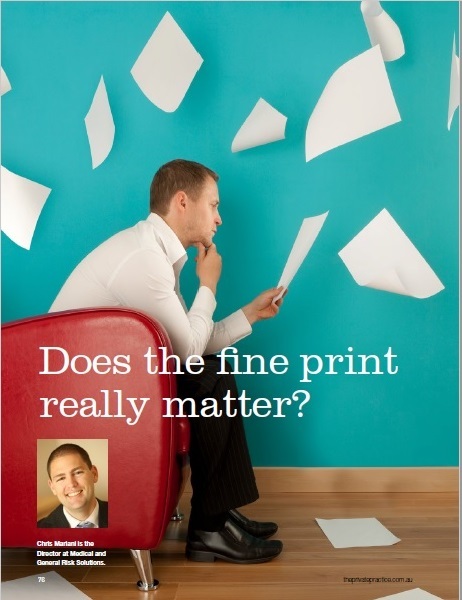 Chris Mariani explains the importance of reading the fine print. In a private practice setting, a doctor is legally liable to compensate a patient where they breach their duty of care to the patient and the patient suffers a loss (assuming the patient decides to bring a civil claim against the doctor). A doctor can’t ask a patient to sign a contract, with the fine print saying the patient agrees not to bring such an action. By contrast, in a business to business transaction – a service provider can (and frequently does) sign a medical practice up to terms of service in which the medical practice contractually promises to not bring a claim against the service provider, even in the case of negligence.